Do you ever wonder what happens on the frozen sloughs and ponds at night, long after all the children are tucked in their beds and dreaming of hockey? Well Marshall the Moose comes out and plays hockey. No, it's true. And yes he wears a helmet - it's made of bark and moss. He uses a rock as a puck. Marshall convinces some of his friends to play too. Friends who just happen to include a bear, a deer, a beaver and a Canada goose. No there's no locking out the moonlit Forest Hockey League. Anything is possible there. 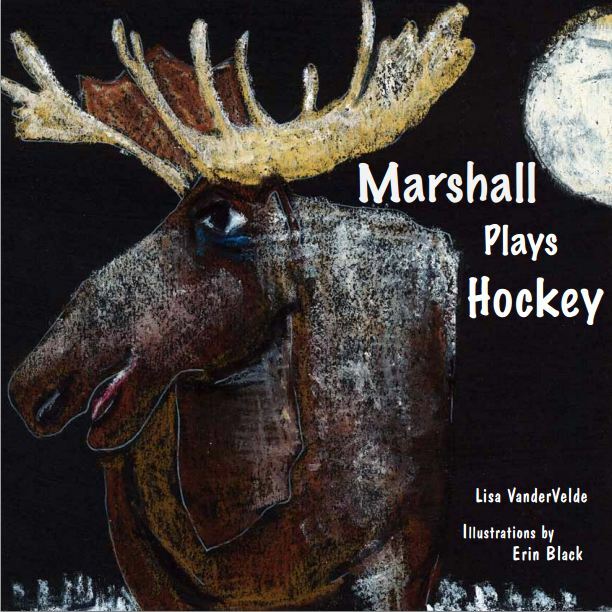 And that's the message behind sisters Lisa VandeVelde and Erin Black's cute new book Marshall Plays Hockey. It's a hockey book for pre-schoolers. Hey, what Canadian pre-schoolers wouldn't love a book about hockey and distinctly Canadian animals! “A lot of books out there on hockey are for older kids. Lots of them are wordy. I wanted a good story that captured Canada’s passion for hockey that a young child could relate to,” said author VanderVelde to the Vernon Morning Star. The book can be found locally in Vernon, British Columbia and Renfrew, Ontario. The rest of us can order the book at http://marshallthemoose.blogspot.ca/. The book costs $15.99 in Canada. Bulk order discounts and international orders are also available.